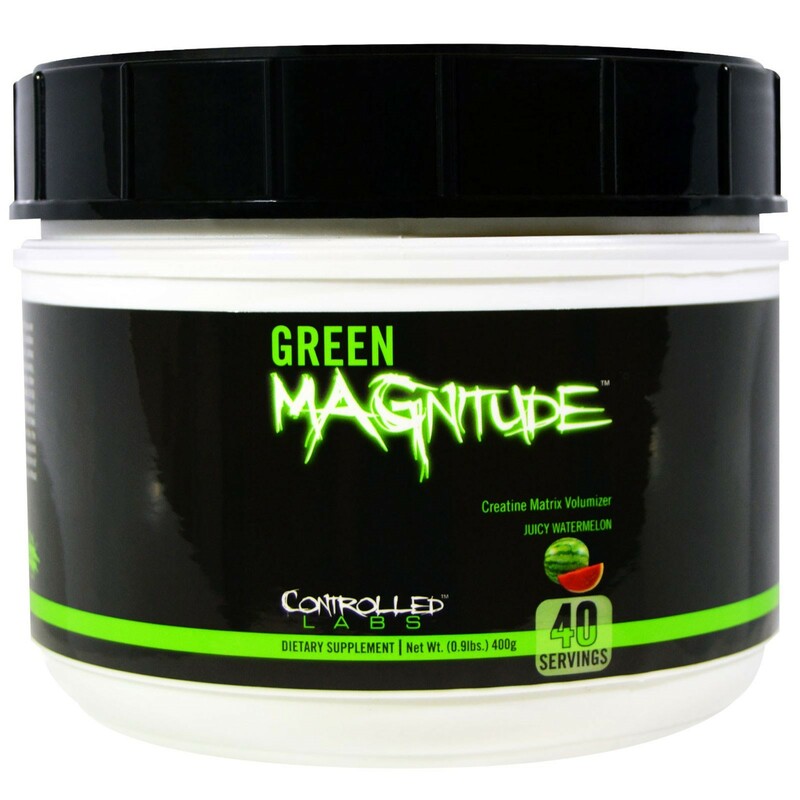 Great fast absorbing creatine complex with added Betaine Taurine, and Tyrosine for better absorption and endurance, this make the supplement a stand alone workout enhancer as well as a great stacker with whatever your currently running. I personally take this with my BCAA’s but it would be just as effective with your pre-workout. 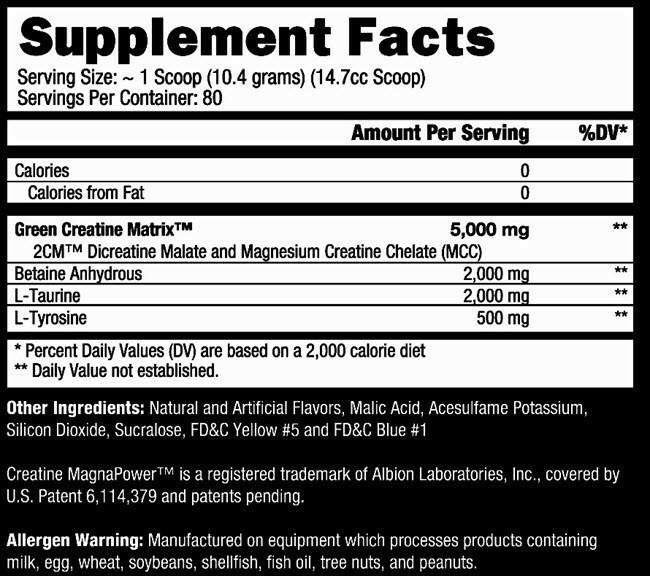 I like to take this during and then add a little creatine mono to my post shake so I’m getting multiple types of creatine into my system but as always its bestsellers to find out what works for you. One of my favourite creatine formulas to run during workouts! 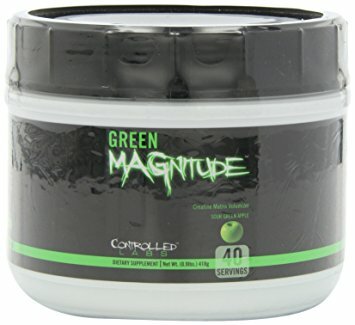 Green MAGnitude, the Creatine Matrix Volumizer Supplement is the most advanced powder creatine matrix ever to reach the market and one of the first creatine products on the market to combine Magnesium Creatine Chelate (a patented form of creatine), with Dicreatine Malate (creatine bound with Malic Acid) to deliver synergistic benefits you can actually FEEL working during your workout. Selsby JT, DiSilvestro RA, Devor ST. Mg2+-creatine chelate and a low-dose creatine supplementation regimen improve exercise performance. J Strength Cond Res. 2004 May;18(2):311-5. Fukuhiro Y, Wowk M, Ou R, Rosenfeldt F, Pepe S. Cardioplegic strategies for calcium control: low Ca(2+), high Mg(2+), citrate, or Na(+)/H(+) exchange inhibitor HOE-642. Circulation. 2000 Nov 7;102(19 Suppl 3):III319-25. Lamb GD, Stephenson DG. Effect of Mg2+ on the control of Ca2+ release in skeletal muscle fibres of the toad. J Physiol. 1991 Mar;434:507-28. Deijen JB, Wientjes CJ, Vullinghs HF, Cloin PA, Langefeld JJ. “Tyrosine improves cognitive performance and reduces blood pressure in cadets after one week of a combat training course” Brain Res Bull. 1999 Jan 15;48(2):203-9. Abraham, G.E, and Flechas J.D. “Management of Fibromyalgia: Rationale for the use of magnesium and Malic Acid” Journal of Nutritional Medicine, 3:49-59, 1992. V.V. Dunaev, et al. “Effect of Malic Acid Salts on Physical Work Capacity and its Recovery after Exhausting Muscular Activity,” Famakol Toksikol 51(3) (1988): 1-25. V. Bobyleva-Guarriero, et al. “The Role of Malate in Exercise-induced Enhancement of Mitochondrial Espiration” Arch Biochem Biophys 245(2) (19086): 470-76. Schrama JW, Heetkamp MJ, Simmins PH, Gerrits WJ. “Dietary betaine supplementation affects energy metabolism of pigs” J Anim Sci. 2003 May;81(5):1202-9. Craig SA. “Betaine in human nutrition” Am J Clin Nutr. 2004 Sep;80(3):539-49. Bakker AJ, Berg HM. “Effect of taurine on sarcoplasmic reticulum function and force in skinned fast-twitch skeletal muscle fibres of the rat” J Physiol. 2002 Jan;538:185-94.